﻿ Do I need to pay estimated Taxes? 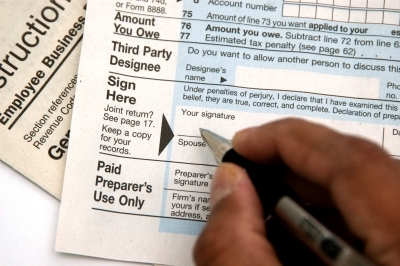 If you are a W2 employee, taxes are withheld from your paycheck and sent to the IRS throughout the year. But that is not the case for other types of income: interest, dividends, capital gains, rents, royalties, alimony, earnings from self-employment, etc. Because no federal income tax is withheld from these types of income, you may be required to make estimated tax payments. A few numbers you need to determine if you should make an estimated tax payment: the tax due amount shown on your 2014 return, the amount of tax you expect to owe for 2015, and the amount of tax you will pay via withholding. Generally, if you expect to owe at least $1,000 in tax for 2015, after subtracting your withholding, you most likely should make estimated payments. If you expect your withholding to be 100% of the tax shown on your 2014 return, then you will not owe penalty. The percentage is 110% for adjusted gross income more than $150,000. Of course, just because you don’t owe penalty, doesn’t mean you won’t get surprised by a big tax bill on April 15th. Calculating an estimate is a good exercise to go through so you are ready in April, even if you don’t make any estimated payments. Your CPA can help you calculate your estimated tax payments. For do-it-yourselfers, you can use the worksheet provided by the IRS in The Form 1040-ES Package. The package provides tax schedules and payment vouchers to use if you make estimated payments. If you use an online service such as TurboTax, you can use it to calculate an estimate and print out payment vouchers. The due dates for estimated payments are April 15, June 15, September 15, and January 15. Be sure to keep track of any payments you make through the year, the IRS will not remind you what you have already paid! Changes to your personal financial situation can affect the amount of estimated tax you are required to pay and a little more complicated to calculate. Your primary goal is to make sure you save for taxes and are prepared for how much tax you will owe. You also want to avoid penalty for underpayment. Everything you read from us will be with these three goals in mind. What’s the one thing that every successful investor does?